An illustration of the Philadelphia Bettering House in 1828, courtesy of the Historical Society of Pennsylvania, which is likely what it looked like in 1776 and 1777 as well. The Bettering House, built in 1766 or 1767, sitting on south Spruce street, was an important part of the city’s landscape. At the time, it was an almshouse, where fever-stricken patients were cared for by nuns and fed warm meals. The house offered monetary and spiritual “relief” to the poor. 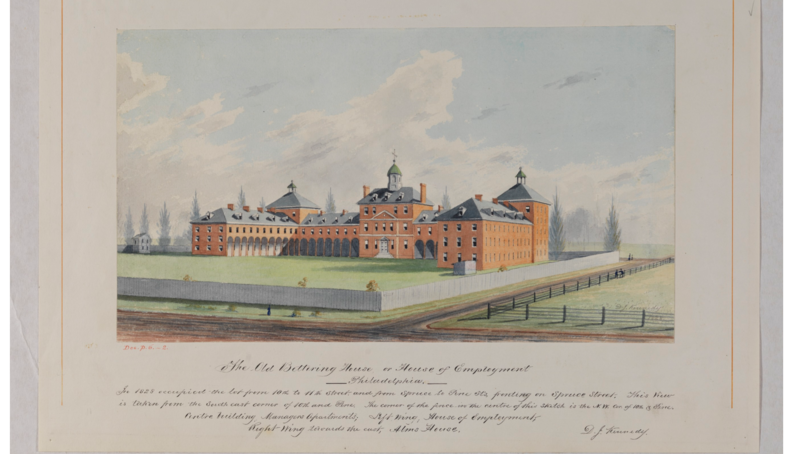 In the main building, the first floor consisted of offices, the second floor was where a steward, governor, and doctors stayed, the third floor housed the sick, the fourth housed people deemed “insane,” and the fifth floor was for other sick individuals. The “paupers” were divided by gender, with men in one side and women on the others, staying in the building’s left and right wings. Of the 98 soldiers housed in the Bettering House, half were convalescent, weak and recovering, or “fit for duty.” Of the other soldiers, they suffered from wounds received on the battlefield, swelling, fever and related illnesses, the digestive disease of jaundice, rheumatic diseases that affect muscles and joints, and other pains in the body. There were also three listed without conditions, one of whom pleaded for a discharge from the house. From 1777 to 1778, after the British victories at Brandywine and Germantown in the fall of 1777, the British occupied Philadelphia, and took over the Bettering House, using it to care for their own soldiers. By that time, the Continentals were still suffering from diseases, illnesses, and war wounds, but they were sent elsewhere or cared for in camps in Morristown, New Jersey, and Wilmington, Delaware, used by the Marylanders in subsequent winters. – Burkely Hermann, Maryland Society of the Sons of American Revolution Research Fellow, 2016. John L. Cotter, Daniel G. Roberts, and Michael Parrington, The Buried Past: An Archaeological History of Philadelphia (Philadelphia: University of Pennsylvania Press, 1994, reprint), 206; Letter from John Adams to Abigail Adams, 13 April 1777 [electronic edition]. Adams Family Papers: An Electronic Archive. Massachusetts Historical Society. Louise Stockton, The Bettering House and Other Charities, A Sylvan City: Or, Quaint Corners in Philadelphia Illustrated (Philadelphia: Our Continent Publishing Co., 1883), 398, 404, 408-410, 418, 422-423, 426; Priscilla Ferguson Clement, Welfare and the Poor in the Nineteenth-century City: Philadelphia, 1800-1854 (Rutherford: Fairleigh Dickinson University Press, 1985), 40, 81, 83-85. It was not the same as the Blockley Almshouse. Gary Nash, “Poverty and Politics in Early American History,” Down and Out in Early America (ed. Billy G. Smith, University Park, PA: Philadelphia, 2004), 16-17; Simon Newman, “Dead Bodies: Poverty and Death in Early National Philadelphia, Down and Out in Early America (ed. Billy G. Smith, University Park, PA: Philadelphia, 2004), 55; Karin Wolf, “Gender and the Political Economy of Poor Relief in Colonial Philadelphia,” Down and Out in Early America (ed. Billy G. Smith, University Park, PA: Philadelphia, 2004), 163, 166, 174, 177, 179, 181-182, 184; Michael Meranze, Laboratories of Virtue: Punishment, Revolution, and Authority in Philadelphia, 1760-1835 (Chapel Hill: Institute of Early American History and Culture, 1996), 152-153; Steven Rosswurm, Arms, Country, and Class: The Philadelphia Militia and the “Lower Sort” During the American Revolution (New Brunswick: Rutgers University Press, 1989, reprint), 27-28. Philadelphia Hospital Reports Vol. 1: 1890 (ed. Charles K. Mills, Philadelphia: Detre and Blackburn, 1891), 4-5. Richard L. Blanco. “American Army Hospitals in Pennsylvania during the Revolutionary War.” Pennsylvania History vol. 48, no. 4 (1981), 347, 349, 352, 354; Mary C. Gillett, The Army Medical Department 1775-1818 (Washington D.C.: Center of Military History, 1981), 70. The influx of sick soldiers led Philadelphia to have a vital role to the Continental army as a smallpox inoculation center, while it was a medical center of the United States at this period. This ameliorated George Washington’s concern about the “threat of contagion” and complimented his attempt to establish hospitals in locations that did not lead to further spread of illness. Philadelphia. As for Maryland soldiers, Thomas Hamilton may have stayed in the Bettering House, but due to conflicting names this cannot be confirmed. After the battles of Brooklyn and White Plains, many of the soldiers of the Maryland 400 were transferred to hospitals. Some were sent to North Castle, New York, like William Marr, due to their wounds on the battlefield, while others, such as John Riley, Valentine Smith, and possibly James Garner, were sent to a military hospital in Annapolis. Later in the war, Walter Muse, then captain of the Second Maryland Regiment, later supervised a hospital as part of his duties. Another man, George McNamara, who enlisted in the Fourth Independent Company, deserted before the Battle of Brooklyn, and was left in a hospital by his new company. Later, James Hindman, his captain, asked that McNamara receive a discharge due to his swollen leg. Colonial And Revolutionary Families Of Pennsylvania, Vol. 1 (ed. John W. Jordan Baltimore: Genealogical Publishing Co., 2004, reprint), 326, 872-873; Richard A. Harrison, Princetonians, 1776-1783: A Biographical Dictionary (Princeton, New Jersey: Princeton University Press, 1981), 210; Gillett, 44, 70. “List of Sick Soldiers in Philadelphia, December 1776.” Pennsylvania Archives Second Series Vol I. (ed. John B. Linn and Wm. H. Egle M.D., Harrisburg: Benjamin Singerly State Printer, 1874), 528, 531-532. “List of Sick Soldiers in Philadelphia, December 1776,” 528-532. Philadelphia Hospital Reports Vol. 1: 1890 (ed. Charles K. Mills, Philadelphia: Detre and Blackburn, 1891), 5-7; Gillett, 109. After the Continentals re-occupied Philadelphia, the Bettering House was again used to house sick soldiers. This entry was posted in Baltimore, Maryland 400 and tagged 1776, 1777, almshouse, Army Life, bettering house, bios, bodo otto, Continental Army, disease, First Maryland Regiment, George Washington, John adams, Maryland, Maryland 400, pennsylvania, Philadelphia, poverty, Revolutionary War, sickness. Bookmark the permalink. A question that I have is, where might he have spent his almost 20 month imprisonment? As an officer, he likely wouldn’t have been on the death ships, like the Jersey, where so many perished. Where would he have been? I look forward to anyone’s informed ideas. That’s a great question. We indeed don’t know exactly what happened to Hatch Dent while he was a British prisoner. However, we know some information about what happened to several other Maryland officers captured at the Battle of Brooklyn, and it’s probably safe to assume that Dent’s fate was similar. Check out the biographies of James Farnandis and William Sterrett. In addition, John Nice, a captain from a Pennsylvania unit, kept a diary during his captivity (he mentions Farnandis): you can read it online here. Thank you for your reply and information. While not specific about my ancestor’s itinerary, I see, on p. 409 of Capt. Nice’s diary, “Lieut. [Hatch] Dent, Charles County” listed among the “Maryland Battalion,” who are of the “‘List of Officers now Prisoners’ in New York, who were captured on Long Island” (p. 407). – In his diary after the battle, I see him note Marylanders twice also on p. 404. I think I should look to histories of the British in New York during the war to glean a little more information about their system of holding officers prisoner there. – Thanks again. Please see the response to this comment in the post about the Battle of Germantown on this research blog.